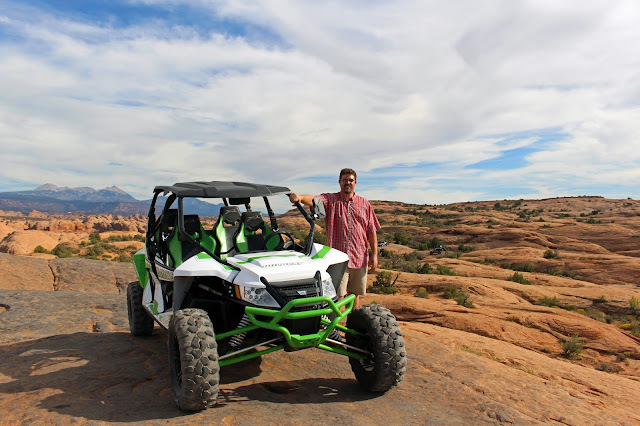 Ed and the Wildcat 4x4 we rented to explore the rock trails in Moab, Utah at Sand Flats Recreation Area. We only stopped in Moab so I could pop in to the Sweet Cravings Bakery and pick up a few of their amazing Oatmeal Cranberry cookies. When I got back to the truck, Ed told me he'd been eyeballing the rental place and thought we should do it. Of course I resisted, but walked over to the shop with him to check it out anyway. I could tell he really wanted to go and the UTV (Utility Task Vehicle) had to be back in three hours, which was better than an all day ordeal, so I acquiesced. And the guy agreed to rent us the 4-seater for the price of the 2-seater, which was super nice of him. He said we'd be more comfortable, which now I think must be code for "fatties need bigger UTVs". I will post more pictures and commentary about the trip, but it wasn't so bad, I actually enjoyed it and I'd do it again. So much so, I don't even think he realized he bought a $330.00 cookie. Hilarious! And also just the kinda photo I like, with a lotta brown in it. great photos and story, next time we're in Moab it's on our list! BELLEDOG: Biking looks hard. You've gotta be in GOOD shape. I'd be dead if I tried to bike those rocks. LOL And although we've been through Banff, we've never really explored it. It's on my list too. EXPATKEN: I think this part of the Southwest is definitely a place to be seen - I wouldn't live there, but it's certainly special scenery.